Smug Sidewalk Ornaments in West L.A.
Smug Scout was delighted by a recent visit from her friend, Smug Eastside Actor, to her distant Westside neighborhood. To help him recover from his long journey, Smug Scout suggested walking to a miniature Smug restaurant row (only three places) where they had the exciting prospect of racking up a jaw-droppingly high bar-hopping tab in just a few hours. However, before they reached their first destination for $14 petite artisanal cocktails, they passed by a business that arrested their attention: ChocoVivo Dark Chocolate Tasting Room. Now Smug Scout was already familiar with ChocoVivo chocolate from having tasted and purchased some at two of her local FMs (long before the store opened). Smug Scout finds it more than acceptable, for it features all the required markers for Smug chocolate: handmade (by a woman no less), small batch, no animal products, apparently the barest minimum of non-white, non-imperialist, non-racist sugar (Smug chocolate is never so vulgar as to be sweet), locally made with allegedly local ingredients like sesame seeds and black peppercorns (maybe India is closer to Los Angeles than Smug Scout thought), and an exclusive price ($6/bar). However, as she and Smug Eastside Actor were thirsty for their artisanal cocktails and adamantly demand alcohol in any establishment billed as a “tasting room,” they really only stopped to gape at the sidewalk ornaments. What are these woodsy curiosities? 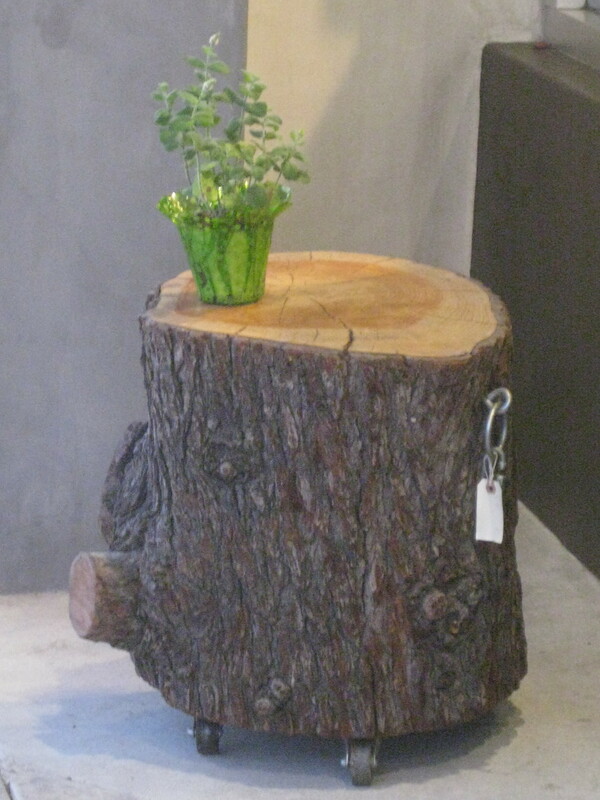 They are tree stumps on wheels that are chained to the sidewalk. Both have scars from amputated limbs, suggesting that these “stumps” were actually segments of a large log, not its base. One of them shows off a bouquet of local vegetation (i.e. sidewalk crack weeds), placed rebelliously near the edge. Of course, what makes these rolling imprisoned not-quite-stumps especially Smug is their utter lack of practical utility. You may think they are seats, though that is a lazy and superficial interpretation. 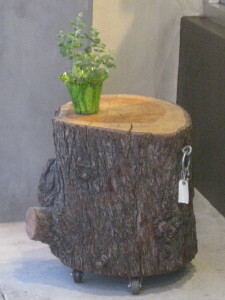 One of them is clearly a table for the flowers (thus giving that one some practical utility for the vase). The other one might work as a seat, if an unstable one, or even perhaps eco-friendly transportation, though you will not get far without a chain cutter. Or could ChocoVivo want to start an urban version of the logroll? In any case, if Smug Scout wants a seat that is backless and spinning, she prefers that it be a bar stool (at a real bar, not a chocolate bar). If she wants “Earth-sensitive” (see endnote) transportation, she prefers a Radio Flyer wagon because she can at least put Smug local produce in it (along with a Smug local child, if one is at hand). If she wanted anything to do with a logrolling contest, she would move to some place where they do that (hillbilly backwoods flyover territory near a river) and become a lumberjack. Smug Scout did not go in for an explanation, though. She knows she is overflowing with sarcastic rhetorical questions, most of them better left unasked. She knows that certain recipients of sarcastic rhetorical questions think she is an irritating smart aleck or even a dimwit. She knew it was time to put a drink in that big mouth of hers. She and Smug Eastside Actor ditched the sidewalk logjam and relocated to some aggressively uncomfortable plastic architectural bar stools that gave them crippling backaches. Those punitive stools are at a place called A-Frame, which Smug Scout believes to be a reference to the medieval torture device known as the Scavenger’s Daughter, though the owners may claim the name refers to the shape of the building, which originally housed that vile mass-produced pancake slinger IHOP. Well, the bottom line is this: Smug Scout wishes all stools were decorative and made of reclaimed wood. Endnote: Credit to Smug Barrington Bartender for that word pairing and Smugly unnecessary capitalization. That chocolate? Go get it! 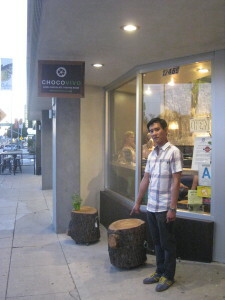 This entry was posted in Buying food, Los Angeles by Smug Scout. Bookmark the permalink. Rolls over your neighbor’s dog? What’s great for a snack and fits on your back? It’s Log, Log, it’s big, it’s heavy, it’s wood. It’s Log, Log, it’s better than bad, it’s good! Everyone wants a log! You’re gonna love it, Log! This seems inane to Smug Scout, but she also cannot quite disagree with it.